The Rhin-O-Tuff wire binder offers a 14″ (356mm) legal size capacity and closes books from 3/16″ to 1-1/4″ thick (5mm to 32mm). The settings for wire sizes are fast and accurate, providing a significant savings on wire costs: wire that is spoiled during the set-up and adjustment of competitive closers. An available optional wire hanger attaches to the HD 8000 and holds the wire in position to hang punched sheets onto the double loop wire. The HD 8000 double loop wire closer module is shown here configured with the OD 4012. 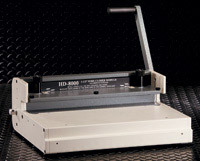 All HD modules will mount on your HD and OD series punch.